Angel artist and Chaos Magickian! 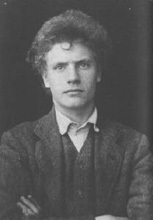 Austin Osman Spare (12-30-1886/05-15-1956), is the most prominent English Angel artists I know. 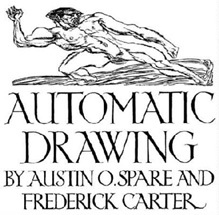 A person obsessively driven to experience the experiment of automatic drawing. Often considered the grandfather of Chaos Magick, Austin Spare was born on December 30th 1886 at Snowhill, London, the son of a City of London policeman. When he left school, at the age of thirteen, he served an apprenticeship in a stained-glass factory, and in the evenings attended the Lambeth School of Art, South London. This enabled him to obtain a scholarship to the Royal College of Art, Kensington, where he began to study in earnest. In May 1904 one of his drawings was exhibited at the annual Royal Academy exhibition in London, generating a storm of publicity for the young artist. 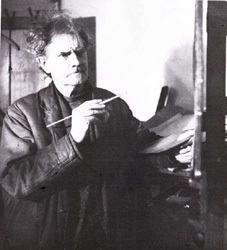 In October 1907 Spare exhibited his drawings at the Bruton gallery in London. 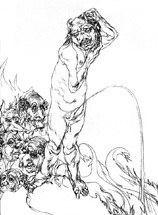 His work resembled that of Aubrey Beardsley, but was full of grotesque, sexualized human figures and magical symbols. 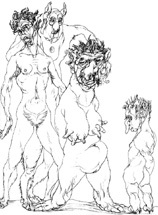 These elements appealed to avant-garde London intellectuals, and brought him to the attention of Aleister Crowley. 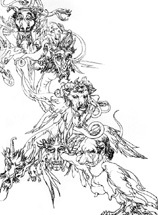 Spare became a Probationer of Crowley's order Argenteum Astrum ("Order of the Silver Star") in July 1909, but was not initiated as a member, although he contributed four small drawings to Crowley's publication The Equinox. Crowley later characterized Spare as a "Black Brother", meaning that he did not approve of the goals of Spare's magical philosophy. 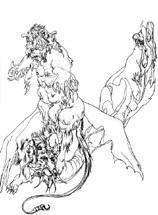 Spare's artistic and magical publications include Earth Inferno, The Book of Pleasure, The Focus of Life, manuscripts of 'Logomachy of Zos' and 'Zoetic Grimoire of Zos' which remained uncompleted at his death on May 15, 1956. 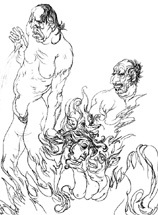 His iconoclasm and aversion to moralism as well as his sigilization was influential on the Western esoteric tradition that later came to be known as chaos magick. Dreams and memories of the Gods. "Out of the flesh of our mothers come dreams and memories of the Gods." Of other kind than the normal inducement of interest and increasing skill, there exists a continual pressure upon the artist of which he is sometimes partially conscious but rarely entirely aware. He learns early or late in his career that power of literal reproduction (such as that of the photographic apparatus) is not more than slightly useful to him. 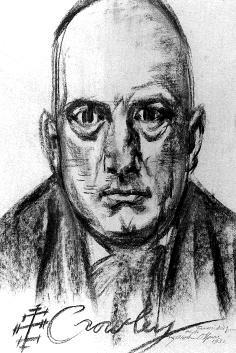 He is compelled to find out from his artist predecessors the existence, in representation of real form, of supersessions of immediate accuracies; he discovers within himself a selective conscience and he is satisfied, normally, in large measure by the extensive field afforded by this broadened and simplified consciousness. Yet beyond this is a region and that a much greater one, for exploration. The objective understanding, as we see, has to be attacked by the artist and a subconscious method, for correction of conscious visual accuracy, must be used. No amount of visual skill and consciousness of error will produce a good drawing. A recent book on drawing by a well-known painter is a case in point; there the examples of masters of draughtsmanship may be compared with the painter-author's own, side by side, and the futility of mere skill and interest examined. Therefore to proceed further, it is neccesary to dispose of the "subject" in art also (that is to say the subject in the illustrative or complex sense). Thus to clear the mind of inessentials permits through a clear and transparent medium, without prepossessions of any kind, the most definite and simple forms and ideas to attain expression. 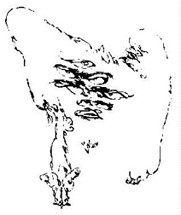 An "automatic" scribble of twisting and interlacing lines permits the germ of an idea in the subconscious mind to express, or at least suggest itself to the consciousness. From this mass of procreative shapes, full of fallacy, a feeble embryo of idea may be selected and trained by the artist to full growth and power. By these means, may the profoundest depths of memory be drawn upon and the springs of instinct tapped. Yet, let it not be thought that a person not an artist may by these means not become one: but those artists who are hampered in expression, who feel limited by the hard conventions of the day and wish for freedom but have not attained to it, these may find in it a power and a liberty elsewhere undiscoverable. Thus writes Leonardo da Vinci: "Among other things, I shall not scruple to discover a new method of assisting the invention; which though trifling in appearance, may yet be of considerable service in opening the mind and putting it upon the scent of new thoughts, and it is this: if you look at some old wall covered with dirt, or the odd appearance of some streaked stones, you may discover several things like landskips (sic), battles, clouds, uncommon attitude, draperies, etc. Out of this confused mass of objects the mind will be furnished with abundance of designs and subjects, perfectly new." 'Renounce thine own will that the law of God may be within thee'. The curious expression of character given by handwriting is due to the automatic or subconscious nature that it acquires by habit. 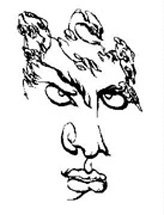 So Automatic drawing, one of the simplest of psychic phenomena, is a means of characteristic expression, and if used with courage and honesty, of recording subconscious activities in the mind. The mental mechanisms used are those common in dreams, which create quick perception of relations in the unexpected, as wit, and psycho-neurotic symptoms. Hence it appears that single or non-consciousness is an essential condition and as in all inspiration the product of involution not invention. Automatism being the manifestation of latent desires (or wishes) the significance of the forms (the ideas) obtained represent the previously unrecorded obsessions. Art becomes, by this illuminism or ecstatic power, a functional activity expressing in a symbolical language the desire towards joy unmodified-the sense of the Mother of all things-not of experience. How to obtain Angel Drawings ? the mind in a state of oblivion, without desire towards reflection or pursuit of materialistic intellectual suggestions, is in a condition to produce successful drawings of one's personal ideas, symbolic in meaning and wisdom. By this means sensation may be visualized.